The holiday season is one of the most stressful times of the year as well as the time when we all seem to do a lot of traveling. There are always so many friends and family to visit and that all of that extra traveling can really take a toll on your body, especially since its happening during cold and flu season. I am a firm believer that vitamins and supplements are essential to maintaining a healthy lifestyle, though when I travel, I frequently forget to pack my daily regimen of pills I need to take, mostly because of the hassle in packing them. Now, with the Tabbi, you can quickly and easily organize your vitamins so that you don't forget to take them while you travel. Keep reading to learn more about this unique travel product! I reviewed the Tabbi Vitamin and Supplement Travel Organizer from Custom Life Solution, which retails for $24.95. I don't know how many times I've went on vacation or to visit family and friends and have been frustrated upon unpacking my things. All too often, the small plastic pill box I used to carry my vitamins and supplements would dump out inside my suitcase while traveling, leaving a mess. Now, it was impossible to know which pill was which and I had to spend the next thirty minutes trying to sort it all out. With the Tabbi, you no longer have to worry about your organized vitamins spilling everywhere in transit. This durable nylon case easily folds up and secures with a flexible strap. This strap makes the Tabbi absolutely spill proof! Next, it is extremely easy to organize your vitamins and supplements in the eight Velcro pockets included on the inside of the Tabbi. You could either organize your vitamins by type or even by what you should take each day and with the included pocket labels, you won't have to worry about forgetting what is in each pocket. 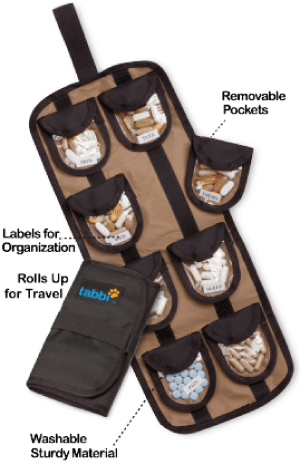 If you need more than eight pockets, you can easily order more from the Travel Tabbi website. The same expandable strap which secures the Tabbi when it's rolled up, is also the same loop you can use to hang this vitamin and supplement organizer on a hook in your hotel room. This way you won't forget to take your vitamins and they are always within easy reach too. Finally, the pockets themselves are small Velcro compartments which can easily be removed from the Tabbi and thrown into your purse, backpack or briefcase so that you will always have your supplements for the day with you when you need them. I absolutely loved the Tabbi and think it's a travel essential for anyone who is concerned with their health while on the go. If you plan on traveling "over the river and through the woods" this holiday season or have an avid traveler on your Christmas shopping list, then I highly recommend filling a stocking with the Tabbi! Disclosure: I received the Tabbi Vitamin and Supplement Travel Organizer from Custom Life Solutions in order to facilitate my review. No other compensation was received. This product review is based on my own personal experiences with this item and is completely honest and objective. I would absolutely LOVE to own this product for I take a Pharmacy full of pills for my pain, Type I (one) diabetes, thyroid, and blood pressure. I am a walking pharmacy! UGH! I WOULD LOVE THIS PRODUCT BECAUSE IT’S ROOMY ENOUGH TO HOLD VITAMINS. I would love to give this to my mother-in-law for Christmas. She has many health issues and this would make it so much easier to keep track of all her meds when she comes to visit us. I would love to have a Tabbi organizer because my pills spill out of ziplocks bags it’s really a mess. perfect for my husband on trips! I “LIKE” Travel Tabbi on Facebook! I “LIKE” Mommy Living the Life of Riley! I entered Tidy Books Kids Bookcase giveaway too! I love that it has removable pockets! tabbi has eight pockets that roll up. I’ve been rolling everything when I travel. It’s easy than folding and my things are less wrinkled. I like the individual pockets! I have several supplements I take and this would help with organization on the go.